MYRTLE BEACH, SC--(Marketwire - Feb 20, 2013) - A hotel isn't a hotel without its guests, and this Myrtle Beach luxury resort goes above and beyond to ensure its visitors leave happy, which is why it was recently awarded a five-star rating from Talk of the Town. Talk of the Town provides "comprehensive and accurate research in the area of customer satisfaction for businesses in the United States and Canada." With a rating system that "combines data collected from customer reviews, surveys, blogs, social networks, business-rating services and other honors and accolades," it aims to recognize those businesses that are doing things right, including this Myrtle Beach family resort. Only businesses with four- or five-star ratings receive a CMUS Talk of the Town Customer Satisfaction Award, and this Barefoot Landing Myrtle Beach hotel is honored to receive the company's highest rating. One visit to the Myrtle Beach Marriott Resort & Spa at Grande Dunes, and it's easy to see why it's a favorite with travelers. These beach accommodations in Myrtle Beach, offering an ocean view, resort view or partial ocean view, are decked out in a soothing color palette with plenty of natural sunshine. Marble bathrooms are equipped with spa-quality products, and a minifridge and coffee/tea service are perfect for early mornings or late nights. Stay on top of work with a spacious desk and complimentary high-speed Internet access. Relax with a luxurious bed and 32-inch flat-screen. This hotel's 22,000 acres offer the full resort experience, from tennis to a full-service European-style spa. Dining options include steak, seafood and stunning views at Ocean's on 82nd, poolside snacks and meals at Ocean Blu and the seasonal Cove, offering American cuisine in a casual setting. With a Fishtank Kids' Club and two pools (including one with a waterslide), this is a great choice for families. A fitness center and sauna are great ways to stay healthy when away from home. To learn more about the award-winning Myrtle Beach Marriott Resort & Spa at Grande Dunes, visit the hotel website at www.marriott.com/hotels/travel/myrgd-myrtle-beach-marriott-resort-and-spa-at-grande-dunes/. 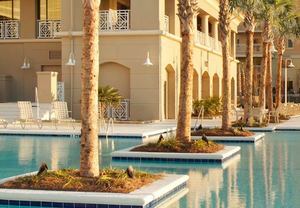 The Myrtle Beach Marriott Resort & Spa at Grande Dunes offers guests a 22,000-acre playground, complete with European-style spa, tennis and a beachfront pool with waterslide. This AAA Four Diamond resort, set within an upscale residential community, provides the latest technology, attentive service and amenities that travelers, both business and leisure, desire with their resort stay. Those on corporate retreats or in town for business can access needed services in the business center, or arrange board meetings, breakout groups, brainstorming sessions and cocktail hours in this hotel's 45,000 sq. ft. of flexible event space. Accommodations offer comfort and convenience with a spacious desk, stunning ocean views, a marble bathroom, luxurious bedding and complimentary high-speed Internet access. Stay focused with a fully equipped fitness center, sauna and indoor pool. Families with little ones will enjoy the Fishtank Kids' Club. For great food and gorgeous views, head to Ocean on 82nd or the poolside Ocean Blu. This hotel's 22,000 acres offer the full resort experience,and with a Fishtank Kids' Club and two pools (including one with a waterslide), this is a great choice for families.